Year 5 and Year 6 pupils at Thorne Greentop School are exploring deep time this term. The dedicated teaching team have compiled an exciting and challenging scheme of work covering recent human history and introducing evolution, natural selection and profiling Charles Darwin. A member of the Everything Dinosaur teaching staff was invited into the classroom to provide a tactile provocation to introduce some of the topic areas to the children. The enthusiastic pupils had already created some fine artwork reflecting early cave paintings. In addition, suspended from the classroom ceiling, there was a row of Stone Age spears that had been made by Upper Key Stage 2, their flint tips represented by carefully shaped tin foil. During each workshop, examples of how animals adapt or fail to adapt to environmental changes were provided. 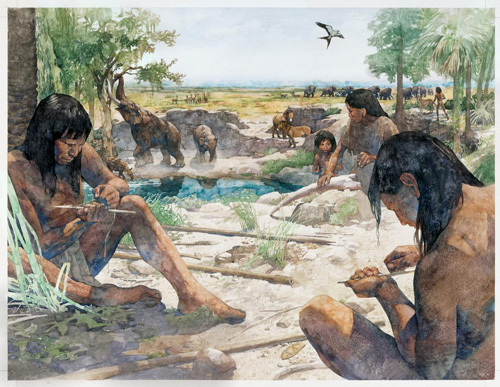 Evidence about life in the past was explored using fossils and the concepts of extinction and de-extinction were examined. As well as learning about life in the past, the thought provoking scheme of work challenged the children to consider how might our own species evolve over time? What changes in us and our bodies will take place? How will technology affect the evolution of mankind? How Will Our Species Evolve? One of a number of extension activities set by the visitor involved the children researching the story of the Coelacanth. Coelacanths were thought to have died out with the non-avian dinosaurs some sixty-six million years ago, until one was caught by a fisherman off the eastern coast of South Africa in 1938. Coelacanth catches are rare, marine scientists have expressed concern about these remarkable fishes, once thought to be very closely related to the first land animals, numbers may be dwindling as commercial activity and pollution destroys their habitat. The innovative plan for the term is to build up the children’s knowledge using a wide range of teaching methods and learning styles culminating in the publication of a workbook that takes the reader through a chronological history of mankind and our planet. We have been promised a copy and we are looking forward to receiving it. Having discussed the types of animals that roamed the landscape some twenty thousand years or so before the school was built, our teaching team member set the children a creative writing challenge. 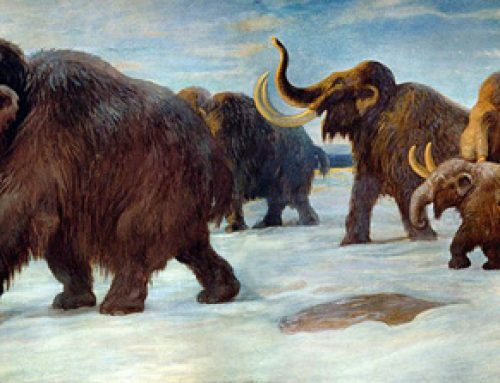 Could they imagine what it would have been like to take part in a Woolly Mammoth hunt? Getting ready for the Mammoth hunt. We look forward to hearing more news from Thorne Greentop school as they explore our Earth’s amazing history.